This test for uric acid crystals report is a layman’s summary of a November 2012 investigation into different methods for detecting uric acid crystals in joint fluid. Graf SW, Buchbinder R, Zochling J, Whittle SL. Synovial fluid is the fluid that surrounds many joints. It lubricates and nourishes the joint, but can become a host for uric acid crystals. Though uric acid crystals can be deposited anywhere in the body, they are usually found first in the joints. This has led to the standard test for gout being an analysis of synovial fluid under a microscope with polarized light. This is known as Polarized Light Microscopy (PLM). It is a fast, relatively low-cost procedure that easily differentiates between uric acid crystals and the calcium pyrophosphate crystals that indicate pseudogout. Unfortunately, there have been doubts cast on the quality of some tests. This has led to considering alternative methods, and it has also raised questions about the storage of samples prior to their examination. The problem of storage has prompted me to recommend that you should only allow this type of test for gout when you are certain that samples will be analyzed immediately. Most rheumatologists will have this test facility on-site, but few family doctors will. 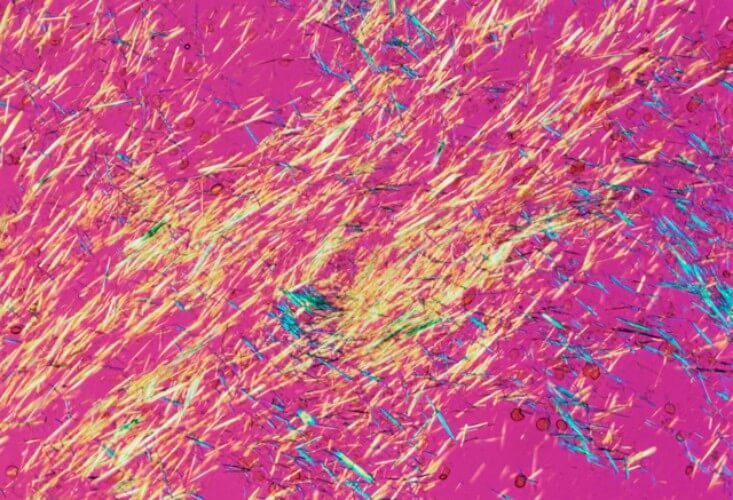 This investigation aims to define the best procedure for identifying uric acid crystals, by comparing different methods of crystal detection. It also seeks to determine the effects of handling and storing samples. The authors conducted a comprehensive review of all relevant published gout studies in PubMed, EMBASE, and the Cochrane Central Register of Controlled Trials. They also included presentations from the annual meetings of the American College of Rheumatology and the European League Against Rheumatism in 2010 and 2011. What is the accuracy of different methods of detecting uric acid crystals in synovial fluid compared to Polarized Light Microscopy? Do synovial fluid storage and handling procedures affect uric acid crystal detection? The authors identified seven studies suitable for comparing the accuracy of different methods of detecting uric acid crystals in synovial fluid. Unfortunately, due to the different study methods, limitations, and risk of bias, the authors could not draw firm conclusions. However, no alternative method proved to be better than polarized light microscopy. The authors identified five studies suitable for assessing synovial fluid storage and handling procedures. Results show that uric acid crystals reduce over time when samples are stored at room temperature. This does not occur in refrigerated samples. Anticoagulation does not improve storage. Dried centrifuged samples remained usable for at least one year. The existing data do not provide a compelling argument for the replacement of Polarized Light Microscopy as the current standard. Synovial fluid sample storage and handling have an effect on uric acid crystals and may impact on the reliability of analysis. Always be aware that, whilst a positive result for uric acid crystals in synovial fluid is a clear indication of gout, the absence of crystals is not an absolute indication that you do not have gout. For most gout patients, a combination of a uric acid blood test, examination of the swollen joint, and the nature of the escalation and resolution of pain will confirm the presence of gout. Where there is doubt, the analysis of joint fluid is your best option. However, you should take steps to ensure that the procedure is carried out by a competent rheumatologist with on-site analysis equipment. Leave Test For Uric Acid Crystals to browse other Test For Gout guidelines.